With rules and regulations trumping human decency, a Columbus, Ohio motel kicked a homeless couple out into the freezing cold on Valentine’s Day, even though their room was paid for by kind strangers. 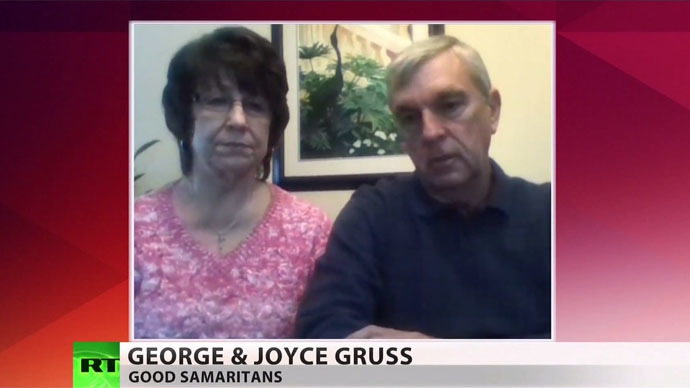 “We would like to see hotels treat humans like humans,” Joyce Gruss told RT on Thursday, as she and her husband George recounted their failed effort to help Stephanie and Louis, a homeless couple they met while passing through Columbus last Saturday night. As the wind chill pushed temperatures into the single digits, George and Joyce found a homeless couple in despair at a roadside restaurant. Stephanie and Louis had missed the curfew at the local shelter and faced a freezing night outside. Moved by their plight, the Grusses booked three nights for the couple at the nearby Super 8 motel and settled them in without any problems. But as they drove on towards Dayton, the Grusses received a call from the motel manager informing them that Stephanie and Louis had been kicked out because they had no identification. Adding insult to injury, the motel informed the Grusses they would not be getting a refund. George Gruss shared his frustration on Facebook that evening, and his son tweeted about it. Within days, a petition appeared online demanding the motel’s parent corporation look into their policy. It has gathered more than 84,000 signatures. “We’re so thankful for the petition, because it is making so many people aware of what is happening,” Joyce Gruss told RT. Though Wyndham has offered George and Joyce Gruss a refund of their deposit, the couple said they would rather see the amount donated to homeless shelters in Columbus. They are hoping their story encourages people to reach out and help the homeless in their own communities, rather than leaving it up to frequently under-funded and overwhelmed shelters. Attempts to find the homeless couple have thus far been unsuccessful.